iOS 11 was announced in early June at the Apple WWDC (Worldwide Developers Conference) 2017, and with it came a lot of changes. One of the most drastic changes in the new operating system is its App Store. 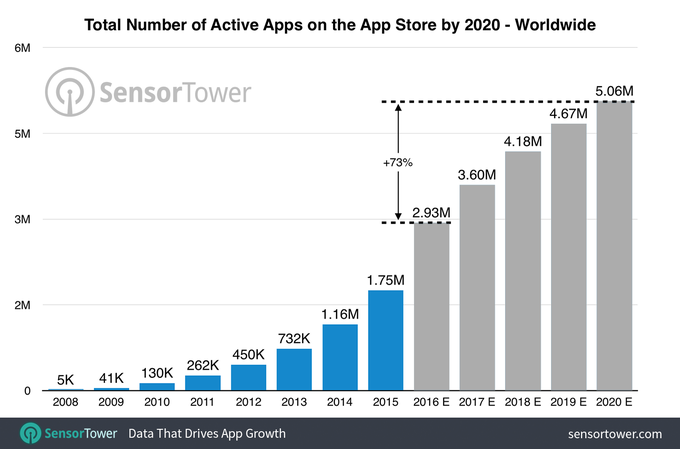 Apple’s App Store was launched nine years ago and currently has over two million apps, and that number is expected to reach five million by 2020. And while Google Play is the largest store with over 2.8 million apps as of March 2017, most people claim that Apple’s App Store is the best app platform in the world, and now Apple has completely redesigned it for iOS 11 to make the app discovery experience better for its users. iOS 11 won’t be released to end users until fall 2017. However, different beta versions have already been released to developers and testers worldwide to try it out and provide feedback. 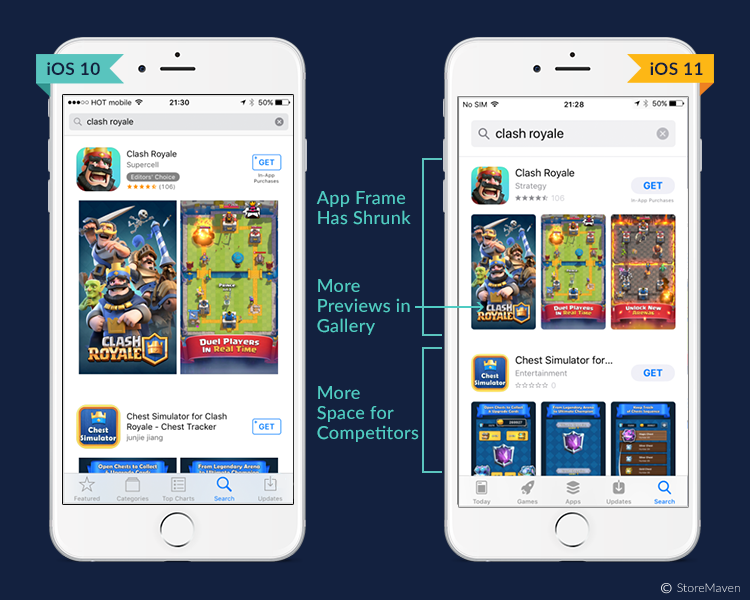 If you’re an app developer, you’ll want to know how these huge changes are going to affect how your app will appear in the App Store so that you can optimize for these changes. Even if you’re just an avid Apple consumer or user, you might want to get an idea of how Apple’s marketplace is changing and how it’s going to affect your experience. So below is an overview of the major changes coming to the iOS 11 App Store (tl;dr). The first change is a completely redesigned homepage for the Apple app store called “Today”. 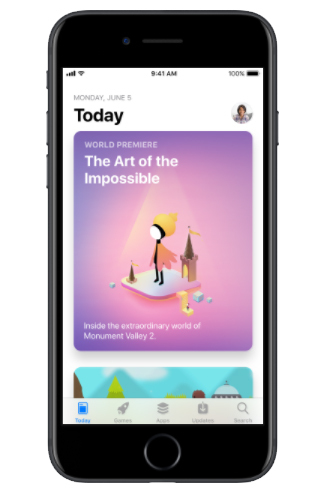 Not only does it feature apps and showcase new releases, but it’s also a new platform for developers to share unique stories about their apps and how they impact our lives through different forms of pictures, videos, and more. In addition, it also includes how-tos, guides, tips, and interviews with developers and influencers. 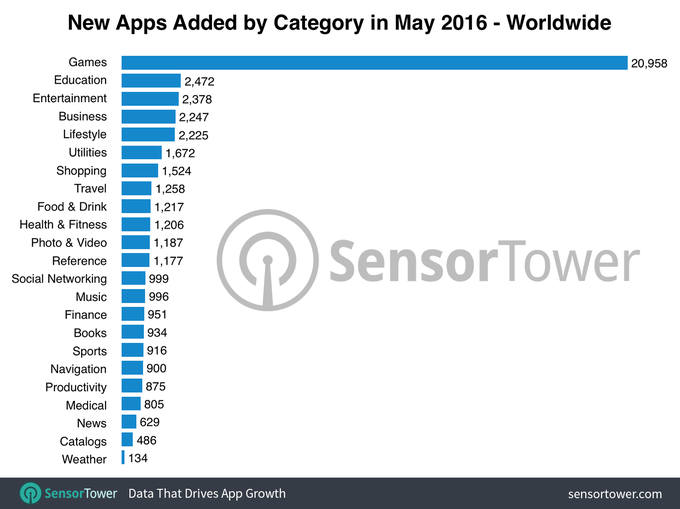 According to SensorTower, about 43% of the 48,231 new apps released in May 2016 were games. That’s almost 10 times more than each of the other categories including education, entertainment, and business. Which is why Apple decided to separate games from being part of the “Apps” category to have its own separate focused category. Apple calls its App Store “the world’s best game store”. In the beginning, Apple allowed up to 255 characters for app names. However, back in September 2016, Apple enforced a maximum limit of 50 characters on app names. Now with the new iOS 11, that will even be reduced to 30 characters. This will now force developers to name their apps something short, simple, and catchy. 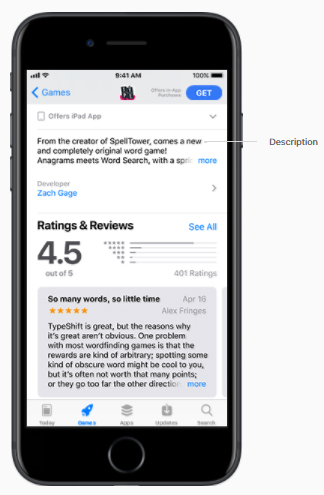 They also introduced a new option to add a short subtitle, also limited to 30 characters, giving you a chance to briefly describe what your app is all about, and communicate your value proposition. This, unlike the actual description, will be visible in the search results. So make it count! Up until this point, Apple has allowed developers to change the app’s description whenever they wanted to. But now, you can only change the app’s description when you’re submitting a new version of your app. So you might need to spend a few more minutes making sure that the description is perfect and exactly the way you want it to be before submitting a new version of your app. Another new field that has been added above the description, which is limited to 170 characters. Unlike the description, you can edit this at any given time without having to submit a new version of your app. It can be used to communicate your marketing message, limited-time events, new features, content, announcements, offers, or discounts. You can feature up to three app previews, which are short videos that help you showcase your app, each up to 30-seconds long. The app previews will now autoplay with muted audio when a user views your product page. Which means that your first few seconds of the preview need to be the most captivating to convince users to download your app. 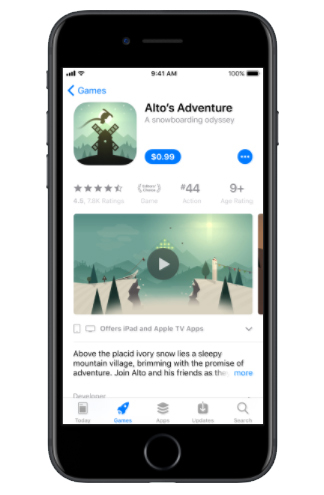 According to Statista, the App Store raked in an estimated 29 billion US dollars in revenue in 2016, with games contributing a huge share made through paid downloads and in-app purchases. So it only makes sense for Apple to make them a focus and help developers promote them. Now you can customize in-app purchases by adding display names, descriptions, and promotional images for each. You can promote up to 20 of them on your product page that users can browse and buy even before downloading the app. Subscriptions and in-app purchases are now treated differently and are split into two separate sections on the product page. 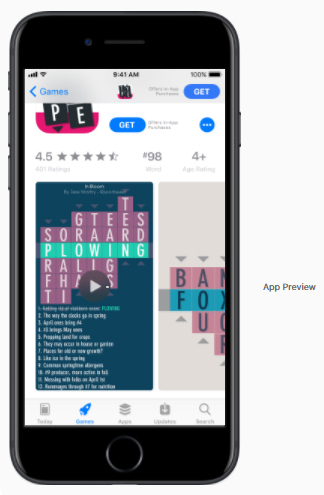 In-app purchases can also now appear in search results, the Games and Apps tabs, or even be featured on the Today page. App ratings are now based on all versions, and not just the latest submitted one. This is very helpful for indie developers who used to wait long periods of time to update their apps for fear that they would lose all their reviews and subsequently their rating. Some would even choose to leave tiny bugs in the app without releasing a fix because of this reason. So now you can release as many versions as you want without having to worry about losing your stars. However, it wouldn’t make sense, for example, for a Facebook review from 2012 to appear as the app has changed drastically since then. So Apple still gives the option to developers to reset their reviews and ratings. With the announcement of iOS 11, Apple stated that they will disallow custom review prompts in all apps. Now Apple provides their own API that you can add to your app to allow people to submit their review within the app, without ever leaving it. They also limited the number of times these prompts can appear to users to three times per year, as many apps were abusing the feature. So make sure to use them wisely! In addition, once a user submits a review, the prompt may never appear to them again even if you have a major update. However, the rating can now carry over across the updates, which means the ratings will be more of an indication of the overall state of your app, instead of just the last release. 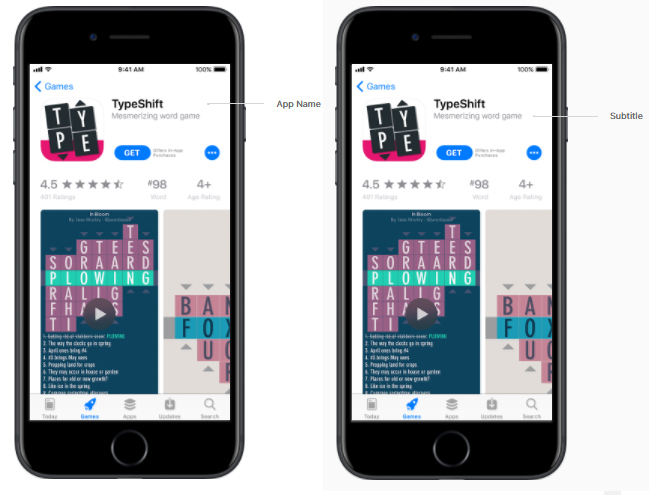 The new App Store also allows developers, for the first time ever, to respond to reviews in hopes of creating a better user experience and assisting users in case of any questions or problems in order to drive better reviews. Actually, we’ve found that the best to way to get better reviews is by capturing negative feedback in beta and communicating with users privately instead of on a public forum like an app store. The search function will be changing in terms of ASO (app store optimization) regarding which data will be indexed or not. Keep in mind the fields that will now appear in search results, like the new subtitle. However, the layout of how the search results are displayed hasn’t changed very much. Apple also seems to have slightly compressed the search results to show more apps than before. That could be a good thing as it shows users more options and thus gives more exposure to developers. However, this can also increase competition and the need to make your app pop out from among the rest. Keep in mind that all the information here is based on the App Store iOS 11 beta versions and while it’s highly unlikely that these new features could change drastically, there might be some slight changes with the final release of iOS 11. Today: A new app store homepage with more opportunities to get your app featured. Games: A new category separate from the Apps tab. App titles: Now limited to 30 characters. Subtitle: A new field, also limited to 30 characters, to further identify your app. Appears in search results along with title. Great for taglines. App description: Now can only be modified with each app release. Promotional text: A new field that appears above the app description. Limited to 170 characters. Great for communicating things like announcements, limited-time events, new features, and offers. 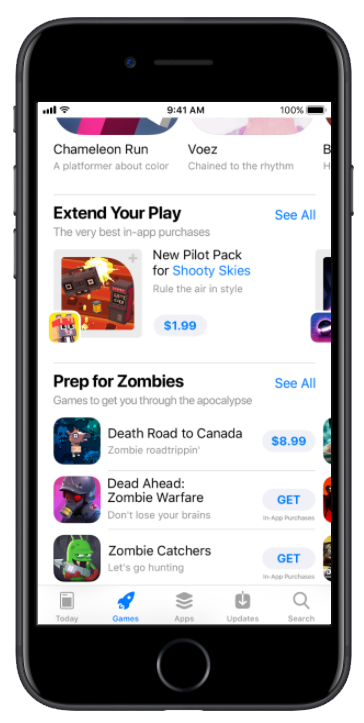 In-app purchases: Now treated separately from subscriptions with its own separate section on the app’s product page that users can browse before downloading the app. Developers can promote up to 20 of these here, with customizable display names, descriptions, and promotional images for each. In-app purchases can also appear in search results, the Games and Apps tabs, and on the Today homepage. Accumulated ratings: Now ratings and reviews carry over to each new version. However, developers still have the option to reset reviews and ratings. 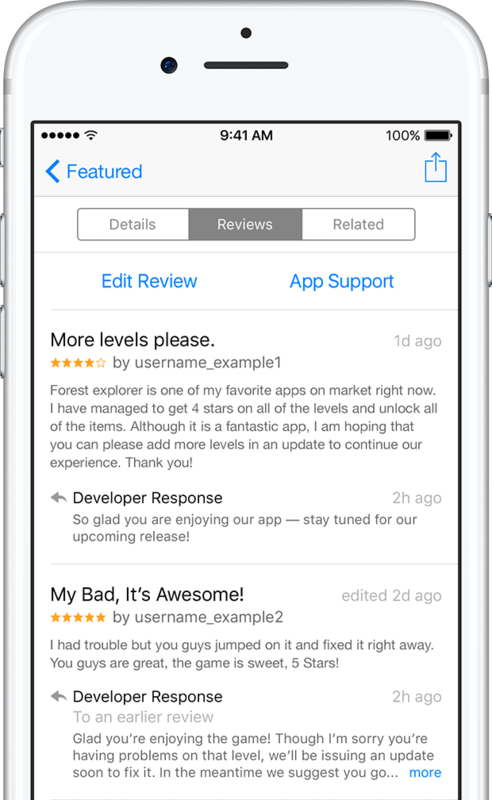 Reviews: Developers can now reply publicly to reviews. Also, no more custom review prompts. 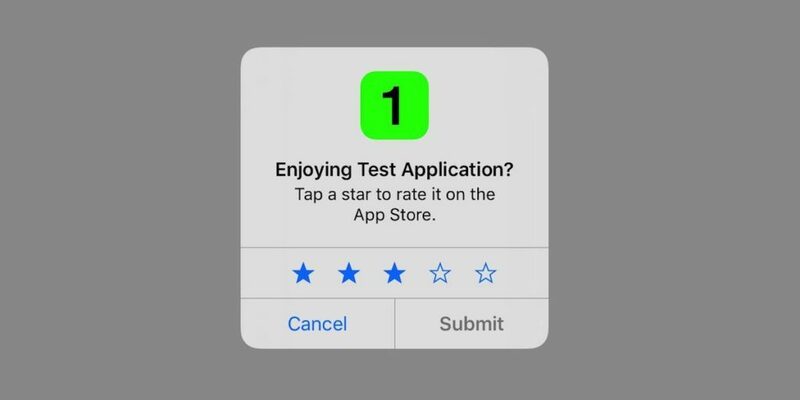 A new API from Apple will allow the app to prompt users to rate it no more than three times. Search results: Subtitles and in-app purchases will be displayed and indexed, affecting ASO. More previews are visible in the gallery. And the space allocated for each app has shrunk so that more of the next app appears on the screen.